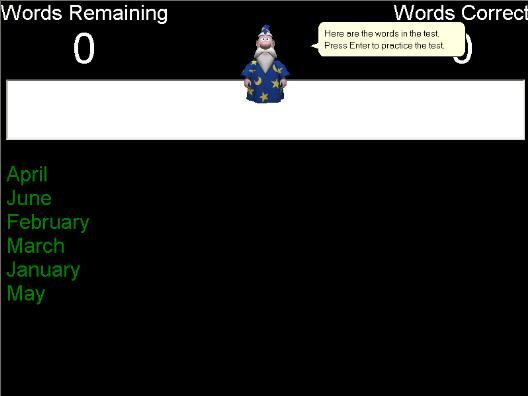 Articulate Spelling is a spelling drill program for use in the home or at school. The program uses Microsoft® Agent Technology to actually speak the words to practice. You can enter your own word lists and create your own tests very easily, and copy and paste to or from common applications like Excel® and Word®. The program is available for as little as £13.99 for home use, or for £75.00 for an educational license. The home version of the program supports a single user, although you can install the program multiple times so each member of the family can have their own words. When the program starts, your child will be given whichever test is current for that week. The educators version of the program allows multiple users to connect across a network, and pick up their own individual word lists. The program is virtually unlimited in the number of different users it supports, and the users can be divided into different groups for years and ability levels within a year. Articulate Spelling can also be used to practice your spellings for Danish, French, German, and Spanish. Just enter the words and choose the appropriate speech engine.